I got this idea for luscious sweet potatoes gratin after I made my now-famous recipe for potato Gratin Dauphinois, then solidified it when I made bacon-rosemary mashed potatoes. 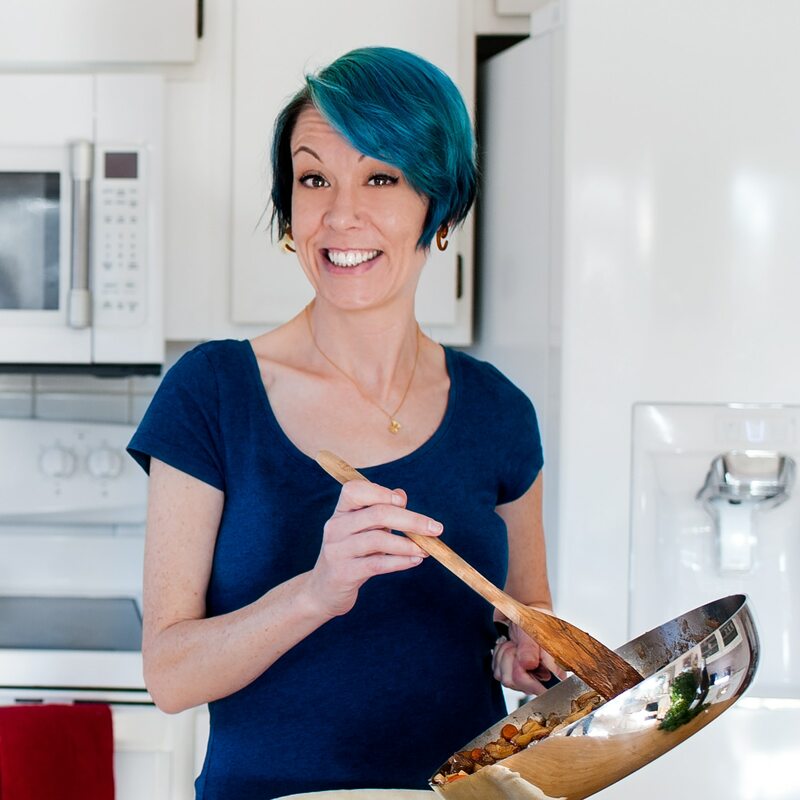 I thought, what if I change up these recipes a little bit, using a different starch and a few new spices? I’m all about experimentation, and I was tired of the same old — though delicious — potato gratin/mashed potatoes recipe. I wanted a new game. And of course, I wanted it sweeter. I opted to use sweet potatoes. Sweet potatoes have less starch than their paler tuberous cousins, so the recipe required a little noodling to thicken the sauce up. I had a block of cream cheese in my fridge, so I used that. The texture of this gratin it nice and thick, with a velvety smooth finish from the cream cheese. The end result is a savory sweet potatoes gratin that curled my toes. 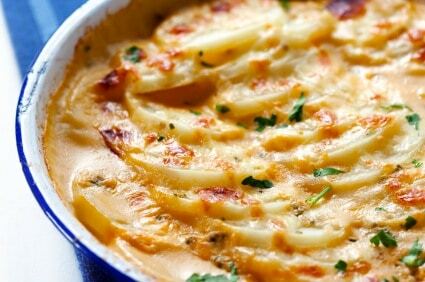 Think potatoes au gratin, but just a touch sweeter. I added a few winter spices to the mix, so this warm, comforting dish tastes similar to pumpkin pie; while it’s baking, the scent of nutmeg, cloves, and cinnamon will drift through your house, beckoning everyone to dinner. This sweet potatoes gratin recipe is soooo luscious and creamy you might just keel over from delight. A down-home taste of country cooking perfect for fall. Preheat oven to 350°F (176°C). Dot the bottom of an 8x8 baking dish or standard 3-4 quart casserole dish with the butter. In a large saucepan over medium heat, bring sweet potatoes, milk, cream cheese, salt, nutmeg, cinnamon and ground cloves to a simmer. Turn heat to low and simmer for 10 minutes, stirring and turning over the sweet potatoes at least once a minute. Once the sweet potatoes are done simmering, add half of the sweet potatoes to the baking dish. Sprinkle gently with salt and pepper, and spread around half of the crème fraîche. Sprinkle with half of the garlic. Add the rest of the sweet potatoes to the dish, and finish with another layer of salt and pepper, the rest of the crème fraîche, and the remainder of the diced garlic. Pour the remainder of the sweet potatoes cooking liquid into the dish. Slide baking dish into oven and cook for 40 minutes, or until the top is golden brown. If you like, finish it with 2 minutes in the broiler to get the golden brown top. Allow to sit 10 minutes before serving, garnished with chopped parsley.